If the oil filter is to be changed, remove and replace it at this time. See “Changing engine oil filter” in this section. Clean and reinstall the drain plug and a new washer. Securely tighten the drain plug with a wrench. Do not use excessive force. 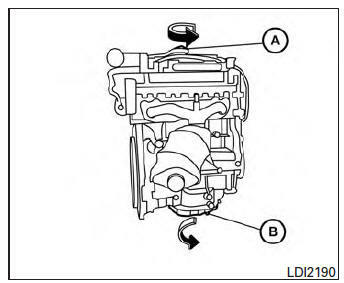 Refill engine with recommended oil through the oil filler opening, then install the oil filler cap securely. See “Recommended fluids/lubricants and capacities” in the “Technical and consumer information” section of this manual for drain and refill capacity. Start the engine. Check for leakage around the drain plug and oil filter. Correct as required.